So you have come into some money (or perhaps freed up a bit of room in your budget) and you are ready to start paying down your debts. Now you just need to choose where to start. Which debts should you pay off first and which ones can wait for later? The choice, believe it or not, is not always an easy one to make. The decision to pay down your debt is typically a wise one. 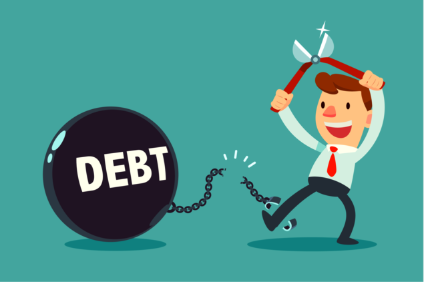 As a result, it is difficult to make a truly bad choice (with a couple of exceptions) whenever you start chipping away at your outstanding debts. Yet it is also true that if you handle your debt-elimination journey wisely, you might be able to get a little more bang for your buck. Plus, paying down your debts in the correct order might not just help you to save money, it could even boost your credit scores as an added bonus. You should almost always begin with credit card debt whenever you start deciding which debts to eliminate first. Credit cards typically represent not only the most expensive debt you carry, but your credit card balances will often do the most damage to your credit scores as well. Many people fail to realize that outstanding credit card balances can lower their credit scores, even if every single monthly payment is made on time. On the other hand, paying down credit card balances could quite possibly lead to a credit score increase. If you have multiple credit cards with balances, it is usually best to start from the bottom (aka the lowest balance) and work your way upward. Paying off your credit card debt in this fashion may potentially help you to boost your credit scores in 2 different ways. First, each time you pay off an account to $0 you will be reducing the number of accounts with balances which appear on your credit reports. Next, when the $0 credit card balance is reported to the credit bureaus you will also reduce the revolving utilization ratio on the account (that is the relationship between your account balances and account limits). Both of these actions are likely to net you a score increase. While it is not necessarily a bad idea to pay off a collection account, it can be a little dangerous to do so without the right information. First, it is important to understand that paying off or settling a collection account, especially an older collection, can sometimes backfire from a credit score perspective. As crazy as it sounds, sometimes zeroing out a collection account on your credit reports could result in lower credit scores. Credit reporting systems have a flaw which may show recent activity when you may a payment on collection account. As crazy as it sounds, some older credit scoring models (like those used in the mortgage world) may consider this recent activity on a collection to be derogatory. As a result, the newly paid collection account could potentially cause your credit scores could drop. The decision to start paying down your debts is generally a wise one. However, remember that you do not have to try to figure things out all on your own either. Working with an expert to repair your credit or to determine which debts you should tackle first can often be extremely helpful. CLICK HERE or give us a call at 214-856-0068 to schedule your free credit analysis today. See how Financial Renovation Solutions can help you begin to renovate your credit and your lifestyle.